LED-Panel ceiling light 62x62cm with 3600LM luminous flux. Affordable LED-Panel, also available as dimmable version (1-10V). Available in 3 different color temperatures. TÜV / GS certified for high electrical safety. 62x62cm LED ceiling light. This kit consist of a 62x62cm LED panel and a silver metal frame that can be mounted at the ceiling. We offer the different color temperatures 3000K (warm white), 4500K (neutral white), 6000K (daylight white) and either as standard or dimmable version. The LED.panel will easily be inserted into the metal frame. It protects the LED-driver from dust. With a very low power consumption of 45watts, it produces a luminous flux of minimum 3800 lumens with a luminous efficacy of 90 lumens / watt. The LED panel has a very nice evenly distributed light , which has no great glare. Shadowing at the edges of the LED panel as observed with cheap LED panels do not occur. The manufacturer ensures 40.000 hours total life time. The dimmable version is using 1-10V dimming technology which either requires a seperate 2 wire dimming cable or a radio controlled dimming controller. The LED-Panel and the power supply is certified by TÜV Rheinland and ensures a high standard for electrical safety. 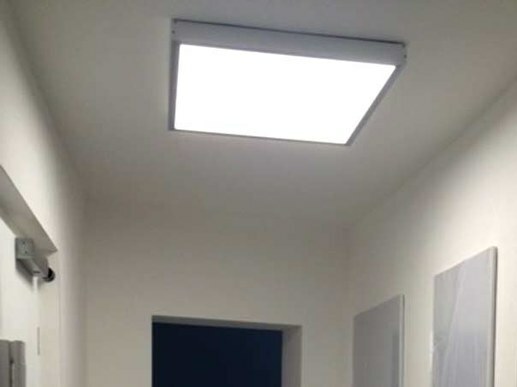 In commercial premises or shop area LED panels are often installed as a replacement for louvre luminaires recessed ceiling luminaire . The LED panels produce no flicker, indicating no unwanted UV light. So it does not lead to fading of products or goods. Included with this Ultraslim LED Panels is the LED panel , the mounting frame, the external LED driver (power supply). LED panels offer a large number of benefits. One advantage of the LED panels are the very good energy efficiency figures and low power consumption. LED panels produce a light output that causes fewer glares and an even light compared with other lamps. 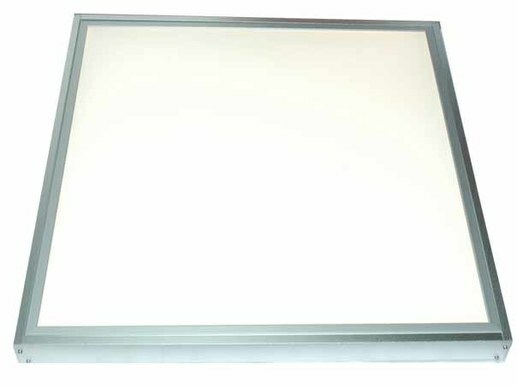 Thus LED panels are well suited to be used in offices with computer screen workspaces. LED panels produce no flicker and UV light. So it does not lead to fading of products or goods. The areas of application of LED panels are very diverse. 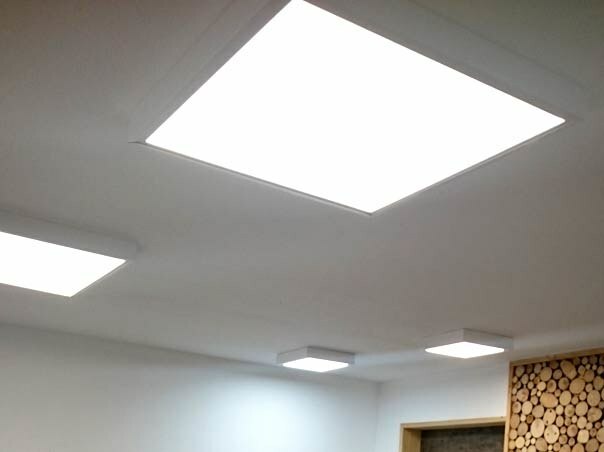 Due to the large-scale and unobtrusive light distribution of LED panels are often used in offices, canteens or in the entrance area of the company. In commercial premises or shop areas LED panels are often installed as a replacement for louvre luminaires and recessed ceiling luminaire .Also in conference rooms, waiting areas , canteens and lounges, LED panels can be found. For health and care in hospitals , medical offices, or in nursing homes, we supply special LED panels , that can eliminate the bacteria , viruses and unpleasant odors . These can be found on the following page . LED panels can be used as a direct and energy-efficient replacement for the 625 coffered ceilings (Odenwald ceilings) with 625 x 625 mm standard measure in direct exchange. These are simply inserted as a recessed luminaire in the raster section of the ceiling grid light. It allows to replace a 4x18 watt grid light to replace it with a 45 watt LED panel. In addition, many LED panels can be dimmed and also controlled flexibly in combination with an ambient light sensor. LED panels can be easily mounted on the wall. Horizontally or vertically! Depending on the size. Great light effects for products or waiting areas can be achieved. The lightweight LED panels can be mounted on ceilings and hanging on wires. Alternatively, there is the possibility of the panel with a mounting frame as mounted luminaire to be mounted on the ceiling. LED Panels are available as direct radiating panel lamp or alternatively as a side emitting LED panels. Here, the LEDs are mounted on the side of the panel and redirect the light with a specific light guide plate to the ground. The advantage of this edge-lit panel is the very low height of just under 1 cm (without power supply). The direct panels are slightly higher in design, achieved through the direct radiation mostly but also a better luminous efficacy in lumens / watt. - LED panels are extremely energy efficient and have a very good luminous efficacy in lumens per watt. - Long life: LED panels have a very long life if quality manufacturer are chosen. They provide expertise in thermal management and high demands on the power supply used. - LED Panels can be used as mounting or mounted luminaries depending on the manufacturer . - LED Panels can be dimmed and are used in conjunction with a lighting control system as a controllable element for daylight utilization. - The low heat emission between 30 and 45 degrees allow a wide range of applications. LED panels do not need additional cooling. - Many areas of application, easy assembly , save power comfortably. You have questions about our Ultraslim LED Panels? for professional use? We will help you! Preferably personally ! Please contact us at the phone number : 0049-221-9924573 during normal office hours or mobile . You can contact us by e -mail or fax request. We also call you back.